Discussion in 'MacBook Pro' started by payne0391, Jun 2, 2014. Apologies if this has been asked already! I'm looking to upgrade the HDD in my mid 2010 MacBook Pro to an SSD. My Question is what is the best way to get all my data, apps and settings across to the SSD? I've heard the easiest way is to use my USB Mavericks install disk to setup as new and then use Migration Assistant with my Time Machine backup to move everything across? Is this a good way to do it or is there a better/easier way? 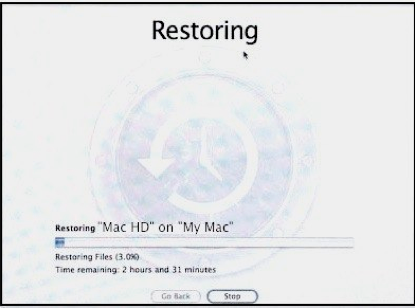 If your Time Machine backup was made with Lion 10.7.2 or later, there is a much easier way. Just install the SSD, then option key boot to the Time Machine drive. This will bring up the recovery screen. From there use Disk Util to erase the SSD to Mac OS Extended (Journaled) format. Then quit Disk Util and click restore. This will move the OS and all your apps and data onto the new SSD. Last step is to restart to the SSD after the restore then go into the Startup Disk pane in System Prefs and set the SSD as the boot drive. So with this method I would not need to install the OS first I could just go straight through the TM method and that would install the OS as well as restore everything else? Exactly. It will move everything to the new drive. Within reason, it shouldn't move any of the old system files - just "user orientated" files. Thanks for the help guys! It should be delivered tomorrow so i'll have a go then! No.. it moves everything. You are thinking of Migration Assistant that requires an OS install first then imports users files. A TM restore like I described moves everything to the new drive. This is essentially the same as using third party cloning software. So would it not restore my settings? I basically want it to be an exact copy of what I had before? Is it better to go down the hard drive caddy and cloning method? DoFoT9 is mistaken. What I described is the same as if you cloned and will move everything. I don't believe I am mistaken. It is not the same as a clone. For example, if you use the Migration Assistant, it will not copy the /System folder (and thusly, any older driver/kext, etc files with it), it will reinstall the /System folder taking the new machine into consideration, and then copy over user specific items (/Users, /Applications, etc) where related. That is the entire concept of the "migration", making the old user related data compatible with the newer system/hardware, etc. Make sense? Don't forget to enable TRIM when you finish! You are mistaken because we are talking about two, different things. You are correct about how Migration Assistant works. You first install the OS then import specific (mostly user) data using MA. But that is not what I suggested to the OP. I am not suggesting using Migration Assistant at all. I am telling him to restore from a Time Machine backup. This moves everything over at once... same as a clone would. This process does not use Migration Assistant at all. Ah yes - quite true. My mistake. However, on that point - and I've not actually tested this before, but is there any documentation on this process? If I were to test this myself, would I see the cloning process, or could I be right and it still performs the same method as I explained in my above post? It really is a clone. You can read about it here (look at the green box section) and here. In your defense, this is all very confusing and commonly misunderstood. I have discussed with a few colleagues, and we all believe that the system files are not a clone, merely the user related files. Just FYI. There is a TM option within MA would this not do the same as Weaselboy's initial method? You can use MA to move your user-orientated data from a TM backup. When I installed my SSD, I used a Mavericks install USB to install the OS, then used MA (during the OS setup) to migrate my data from my old HDD, with the drive in a USB enclosure. Worked beautifully. I only had 2 or 3 apps that needed extra attention as a result of the new OS/migration, and that was very minimal. Sorry... but your friends are mistaken. You can take a blank drive and option key boot to the TM disk, format then restore and you have just cloned the TM backup to the new drive. I provided documentation and I have done this myself as well as suggested it to many forum members who have had the same result. Your friends are thinking of the Migration Assistant process. No it is not the same. To use Migration Assistant you have to first install the OS onto the drive in some way. That can be through Internet recovery or off a USB key... then after the OS install one can run Migration Assistant to import your user data and select the Time Machine backup as the source for that Migration Assistant import. What I am suggesting skips having to install the OS. You just option key boot from the TM drive, format the new disk then restore. This puts everything back on the new drive. The entire OS, your apps, your personal data... everything. Your links don't actually give any evidence to prove that it's a direct clone. It goes over the steps and procedures of how to restore the older TM backup to a new disk very well, but no justification whatsoever to state otherwise. If you really like, I could simulate this scenario - capturing data as it goes along during the restore to show you that only SOME directories are restored and others are installed fresh from the "installation image". I stand by my original claim, sorry. I will try this method and as long as i have my original drive, usb install drive and my TM backup i can always re-do it another way. We must be reading different articles then. The pages I linked show how to use a TM backup to completely restore a system to a new disk. If the OS folders or whatever are not coming from that TM backup, where do you think they are coming from? I don't even understand any more what you think is happening with a TM restore. What "installation image" are you talking about here? Nothing gets downloaded over the Internet with this restore. It all comes from the TM backup disk.